Fresh produce donations and the SHARE Food Network at New Samaritan Baptist Church (NSBC) are two programs available to support a healthy community through nutrition. Both programs are under the Missionary Ministry at NSBC, which is located at 1100 Florida Avenue NE. Each Thursday at 11:00 am NSBC has a free fresh produce giveaway. This program is open to the public and they request that people bring their own bags (and some patience). All will be served until all of the produce items are disbursed. On the third Saturday each month (10 am to noon) the AGAPE Closet is open for canned goods distribution and also used clothing. Catholic Charities runs a SHARE Food Network for healthier families and stronger community. Through the SHARE program here in the DC metropolitan area affordable and nutritious groceries are sold at volunteer-run locations. The monthly value packages cost just $21 and include $40-$50 worth of basic and healthy groceries, typically made up of 4-5 pounds of frozen protein products, 1-3 grocery items, and 8-9 pounds of fresh produce. Savings of almost 50% off grocery store pricing is achieved through bulk ordering and volunteer support. Additional FAQs about the SHARE Food Network is on the website (http://www.catholiccharitiesdc.org/SHAREfaq). NSBC is a volunteer-run host site for the SHARE Food Network. The program is open to everyone and there are no income or other limits on participation. SHARE accepts cash, food stamps, money orders, and organizational checks. The contact person for the SHARE Program is Susan Harper. She may be reached at (202) 547-5839 to schedule orders and for any additional information on dates of share bag availability. They are normally ready for pick up on the last Saturday each month, depending on holiday schedules. These are great programs that can help our neighbors. Please share the information with those that may be interested! The Department of Employment Services is pleased to offer two pre-screening/application events for the new Walmart at the American Jobs Center-NE (Bertie Backus) location on August 4th and August 12th. The new Walmart facility is set to open at Riggs and South Dakota (close to Ft. Totten metro station) and will be hiring approximately 300 associates for a variety of jobs that include professional services, sales floor associates and supervisors, front end cashiers, customer service, cart pushers, greeters, stockers and others. The pre-screening/job application sessions will take place in Ward 5 at the American Job Center – Northeast. The event flyer is attached and details are below. What: Secret Monkey Social Club, the brainchild of Lukas B. Smith (currently of Dram & Grain and Jack Rose Dining Saloon, formerly beverage director of Daikaya) and Shayna Blass (actress, singer and dancer) aims to pay homage to the cabarets of decades past with a lounge environment full of drinks and jazz. Details: Guests will enjoy five new punches prepared by Smith and guest bartenders at $9 per pour, and cabaret performances lead by Blass throughout the night. DC Based actress and jazz singer Nora Palka, as well as local five piece psychedelic funk hop band Picnibus, will be featured along with Blass. This event is 21+, and there is no door charge. Food will be provided by Dirty South Deli (DC’s Southern influence food truck) and grills from Devin Gong of Copycat Co. Crunkcakes master baker Faith Alice Sleeper will be baking cakes inflused with booze. The Drinks: Smith will be joined behind the bar by Carlie Steiner from Barmini and Stir Bartending Company, and Vance T. Henderson, Beverage Manager for Think Food Group and Portfolio Associate with William Grant & Sons, Sarah Rosner of Copycat Co, Andrea Tateosian of Urbana, and Rachel Kling of Quill Bar. One of the issues that residents often mention in crime and safety meetings is prostitution along West Virginia Ave NE. Recently the DC Police Department posted two press releases on July 24th and July 25th (see below) highlighting 13 arrests for soliciting prostitution in Trinidad. The operation is on-going and the DC Police Department will provide additional updates as it continues. (Washington, DC) – Members of the Metropolitan Police Department’s Narcotics and Special Investigation Division Human Trafficking Unit announced 6 additional arrests have been made in a prostitution enforcement operation. On Tuesday, July 14, 2015, the Metropolitan Police Department’s Human Trafficking Unit began conducting prostitution enforcement. The 6 arrests between the overnight hours of Friday, July 24 and Saturday July 25, 2015 bring the total arrested in this operation to 63 since Tuesday, July 14, 2015. These incidents occurred in and around the Trinidad neighborhood, in Northeast. All arrested were adult males charged with Solicitation of Prostitution. The Metropolitan Police Department continues to respond to complaints about crime and encourages the public to contact Metropolitan Police Department with concerns about crime. (Washington, DC) – Members of the Metropolitan Police Department’s Narcotics and Special Investigation Division Human Trafficking Unit announced 7 additional arrests have been made in a prostitution enforcement operation. On Tuesday, July 14, 2015, the Metropolitan Police Department’s Human Trafficking Unit began conducting prostitution enforcement. The 7 arrests between the overnight hours of Thursday, July 23 and Friday July 24, 2015 bring the total arrested in this operation to 57 since Tuesday, July 14, 2015. These incidents occurred in and around the Trinidad neighborhood, in Northeast. All arrested were adult males charged with Solicitation of Prostitution. Where Can I Learn ASL? Where Can I Learn ASL? That is a question often here around our neighborhood. Trinidad is multi-lingual neighborhood with English and American Sign Language (ASL) as two dominant primary languages. Our proximity to Gallaudet University means deaf and hearing neighbors often have need to communicate in ASL, the predominant sign language used in North America and Canada. For those of us that are new to ASL, there are many ways to learn and many sources for resource material. You can start by signing with neighbors to learn basic signs or check ASL instruction books out of the library. The DC Public Library has a list of available resources on their website. (add link http://dclibrary.org/node/5884). A few online programs, apps, and courses a noted below. If you know of other good sources for ASL instruction or practice, please let us know at trinidadneighborhood@gmail.com. American Sign Language University (ASL University) is an online American Sign Language curriculum resource center that provides many free self-study materials, lessons, and information. They also have fee-based instructor-guided courses. Anyone wishing to do so may use the online course material at www.lifeprint.com for personal study. The site contains more than 30 courses plus practice quizzes and games. Signing Savvy is a sign language dictionary containing several thousand high-resolution videos of American Sign Language (ASL) signs, fingerspelled words, and other common signs used within the United States and Canada. A guest may browse the site to find signs for words, organized by letter, but will have limited access to resources on the site unless joining and payment of a monthly or annual fee. ASL Deafined is a website for both deaf and hearing. They have as part of their mission to provide a platform for teaching and encouraging the community-at-large to learn and utilize the basic skills of ASL. The subscription based website has ASL video instruction. Rates are from $10 per month to $200 per year. ASL Pro has free reference and learning tools available to the public. These include a video dictionary, conversational phrases, and ASL for babies. There is also content that can be accessed through membership. There are many other programs and more to come in the future. For example, Gallaudet University has received a grant from the Morris and Gwendolyn Cafritz Foundation to develop ASL Connect, an on-line learning resource. You can learn more about that on the GU website at https://www.gallaudet.edu/news/asl_connect_.html. There are an abundance of YouTube videos available but be careful that any videos you use to learn ASL words or phrases were created by someone certified in ASL instruction. There are many apps available for free or purchase that teach ASL. Two that have been used by TNA members are highlighted here. The ASL App was created by Deaf people to introduce and teach conversational ASL to anyone interested in learning without enrolling in a class. It’s called “ASL for the People” because this is for anybody including but not limited to family, friends, co-workers, or your average Joes who want to learn ASL. The app is free to download and includes a few basic lessons with additional in-app purchases. Marlee Signs is another app that teaches fundamentals (alphabet and basic vocabulary) with ability to practice at your own pace. The download is free and includes a few lessons with additional in-app purchases available. Gallaudet University (GU): GU is the world’s only university with programs and services specifically designed to accommodate deaf and hard of hearing students. GU offers degree and non-degree courses, professional studies, and continuing education credit courses. To enroll in ASL classes you should first register and be accepted as a student. Visit the GU website at https://www.gallaudet.edu for general information or the Center for Continuing Studies ASL pages at http://www.gallaudet.edu/asl/asl_courses.html for specifics on ASL class options. You can also email aslprograms@gallaudet.edu with questions. Information on fees can be found at http://www.gallaudet.edu/ccs/registration_and_fees/financial_information.html. Graduate School USA: Formerly the USDA Graduate School, Graduate School USA is a private non-profit educational institution that has evening and weekend classes towards certificate programs or continuing education credits. They have beginning and intermediate ASL courses that run approximately $320 per semester. Visit the website at http://graduateschool.edu/index.html or call (888) 744-4723 for additional information. Kendall Demonstration Elementary School (KDES): KDES is on Gallaudet University campus, just past the West Virginia Avenue entrance. The school offers a free ASL course geared towards hearing parents and family members of deaf students. When the class is not full, they extend places in the weekly class to the general community. Following the school calendar there are two semesters (roughly September to December and February to May with registration the week or two before sessions begin) and a long summer break. Typically the classes are on Wednesday evening (6 pm – 8 pm) or Saturday morning (10 am – noon). KDES classes are divided into beginner, intermediate, and advanced. The contact for recent classes has been Tara Miles who can be reached by e-mail at Tara.Miles@gallaudet.edu or by office phone at (202) 448-7318 (V) or (202) 250-2211 (VP). DC Public Library – MLK Memorial Library Branch: DCPL typically holds a beginners’ level class, which covers 100+ ASL vocabulary words and rules of grammar, on Tuesdays at 5:30 pm. The class is on hiatus for the summer months and will restart in the fall (pending identification of an instructor). The class is free and open to the public and there is no need to register. Any level signer is welcome to join the class, review what you know, learn new signs, and practice conversation. To learn more or check into availability, you can contact the MLK library branch by e-mail at lbph.dcpl@dc.gov or call (202) 727-2142. Tutors are also available in the community and from the student population. You can ask deaf members of the community to identify someone that may have time available to teach you at your own pace. There are some local gatherings or regular events where you can learn or practice ASL. Vendetta at 1212 H St NE hosts ASL Trivia on the second and fourth Monday each month. They have a Facebook page with more information. During the Capital Fringe Festival, Dog and Pony DC has been holding four back-to-back 15-minute sessions to teach the Basics, the Theater, The Bar, and the Wild Card. These are free lessons so check the Capital Fringe website for show times and stop in the outdoor seating area where the lessons are held. We hope to see more of Dog and Pony DC working with us in the future. The Argonaut at 1433 H St NE has ASL poker night the first Saturday each month at 8 pm. Join them upstairs for poker games and conversation. Search the Meet Up website for current information on discussion groups or ASL-related events. Current listings include an ASL Bridge Meet Up for students, teachers, and fluent signers. The group is based in Silver Spring and meets every two weeks on Thursdays. See the website for information and membership. Sign and Dine in Crystal City Shops meeting the second and fourth Saturdays for lunch and other events are held in Wheaton, Rockville and Ballston. Busboys and Poets has an ASL Open Mic Night the last Friday of each month at the 1025 5th St NW location from 11 pm to 1 am. Tickets are $5. Trinidad has started building Little Free Libraries (LFL) to bring books closer to the community. These were presented in the fall and spring at a TNA meeting and the first one up and running was built and installed by Trinidad resident Aaron Williams in the 1100 block of Staples Street. 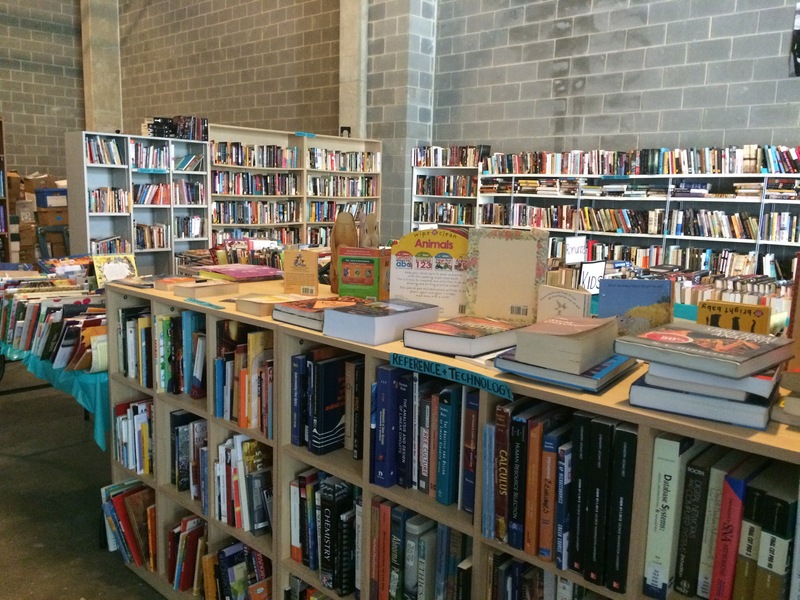 It is stocked with both children’s and adult books. Please stop by to drop off a book you have finished or pick up a new one to read! 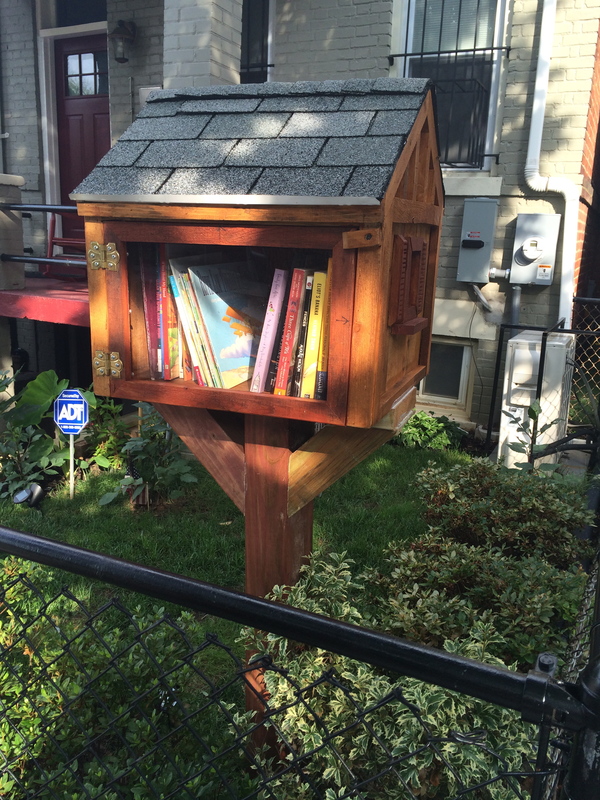 This LFL is being registered and will soon be on the map at http://www.littlefreelibrary.org. A little farther from Trinidad near the NoMa metro there is a pop-up book store. Carpe Librum opened a temporary used book, CD and DVD store at 140 M Street NE. They are open from 11 am – 7:30 pm on weekdays and 11:30 am – 6 pm on Saturdays (the shop will be there at least through the end of August). 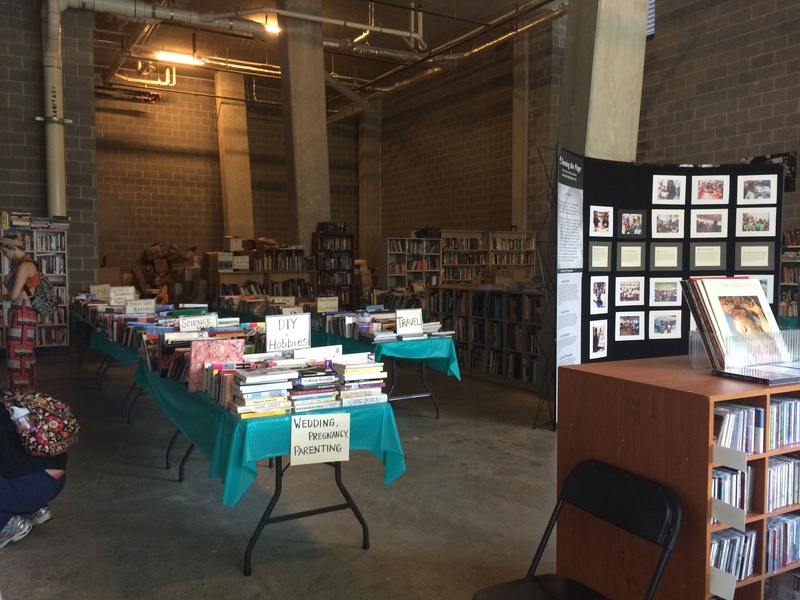 Prices for books, CDs, and DVDs are between $1 and $4. The pop-up is working with Turning The Page, an educational non-profit. Proceeds support family engagement programs in DC public schools. There is a display on Turning The Page programs or you can find more information at their website (www.turningthepage.org). Be Part of Mobilizing Our Community – An Arts Project! The Trinidad Neighborhood Association is collaborating with the Atlas Performing Arts Center on Mobilizing Our Community, an arts project aiming to bring balance, beauty and connection to Trinidad and the Greater H Street Communities. You can be part of this hands-on project — help design, paint, and balance pieces for mobiles with kinetic artist and performer Kevin Reese of SchoolSculptures. Mobilizing Our Community will culminate in an installation of 50+ mobiles at the Atlas Performing Arts Center, opening at the H Street Festival on Sept 19 and running through Art all Night on September 26th. The mobiles are being created now through early September in workshops involving diverse community members, both at the Atlas and off-site. Check out the video of a similar mobile project Kevin did with the community of Wausau Wisconsin. Sounds like fun, right?? Meet Kinetic artist Kevin Reese, who will introduce how mobiles are made and balanced through the making of small mobiles (or maquettes). The theme of our project is “balance and connection in an evolving city.” Participants respond to that theme in the design, shapes and sizes of their model-mobile. Workshop is best for ages 8 and up. Register here via Atlas PAC. During the workshop, participants are introduced to the project and to models of mobiles created by other community members. They each then envision their own pieces for the mobiles, working with the material brought by Kevin, and draw, cut out and sand the pieces. Kevin also brings completed pieces on wires and demonstrates, with the help of the participants, how a mobile is balanced and assembled. As people are working together to create their pieces, we facilitate conversation around the project’s theme. Workshop is best for ages 8 and up. In the week leading up to the unveiling, Kevin and community members will be assembling the full 50+ mobiles inside the Atlas. See how the earlier work comes together to create a final integrated piece of community art. There is limited space for this event, so please make sure you can attend before you RSVP. During the TNA Social at Atlas Brew Works in June, our tour guide noted that another distillery was soon to open in Ivy City in the space above the brewery. There was little information at the time but now there are articles coming out in local publications as the date approaches for the Joseph A. Magnus Distilling Co. to open and start tours in August. One article in the Washington City Paper can be found here. Previous articles from March 2015 can be found here and here. We look forward to adding a tour to our social outing calendar in the fall. National Night Out (NNO) enhances the relationship between neighbors and law enforcement while bringing back a true sense of community. It also provides a great opportunity to bring police and neighbors together under positive circumstances. This is needed as across the country law enforcement and communities have been in less than positive interactions, as reported in too many recent news articles. NNO is held the first Tuesday each year as a community-building campaign promoting police-community partnerships and neighborhood camaraderie to make neighborhoods a safer, better place to live. It was started by the National Association of Town Watch (NATW), a non-profit crime prevention program. This is the 32nd year of the night against crime and the Metropolitan Police Department has organized activities in Patrol Service Areas (PSA) across the city to participate in the national set of events. In Ward 5, activities will center around the Starburst Intersection on Tuesday, August 4th. Description: Join the Fifth District for an evening to celebrate community pride, unity, and most importantly our public safety partnerships. We will provide crime prevention tips/safety information, good food, great music and more. Residents will have an opportunity to meet and mingle with MPD Command staff, the CAC, and with your Neighbors. Pack up the Kids, put on your comfy dance shoes, come on out, and GET F.R.E.S.H. with MPD5D. To learn more about MPD’s NNO program, click here or download the flyer here: NNO 2015 Kickoff. Mr. Alexander Hastings has submitted BZA Case 19074 for special exception from rear yard setback to construct a garage at the rear of the property with a two-story addition, and connect it to the existing house with a covered walkway. The addition will house an accessory apartment. While the process to review each are the same, a special exception is to approve certain uses of land whereas a variance is requesting relief from application of zoning regulations. The proposed construction would be 24 feet high and there will be a larger than required side yard (5 feet required; lot will have 8 feet side yard). The lot occupancy with the new construction will also be smaller than the maximum. The special exception is requested for the rear yard setback. The required is 20 feet and with the proposed construction there will be a 2 feet setback from the alley. The construction will not be out of character with the alley as there are already several garages built to the same line. There are also multi-story apartment buildings across the street so the building will not exceed houses or apartments in size. The apartment will include a parking space so there should not be impact on street parking. Documents about the case can be found on the Interactive Zoning Information System (IZIS) website. The hearing for this case will be held on Tuesday, September 29th at 9:30 am. The public hearing will be in the Jerrily R. Kress Memorial Hearing Room, One Judiciary Square, 441 4th Street NW, Suite 20 South. Prior to the hearing there should be a Single Member District (SMD) ANC 5D06 meeting with Commissioner Yvonne Buggs and Mr. Hastings to discuss the project. This will precede presentation at an ANC 5D meeting where there will be a vote on whether the ANC will support the project based on the community’s input at the SMD meeting. Anyone that cannot attend meetings but wants to weigh in on the special exception can submit letters to the BZA for review. These can be submitted on-line. Directions for submission are on the BZA site.